You can give your 2018 Dodge Journey an entirely new look with the available blacktop package. This package is inexpensive and will make your car look uniquely cool. The blacktop package includes 19-inch glossy black aluminum wheels over the regular chrome colored ones. It also includes shiny black color exterior mirrors instead of the standard mirrors. The headlamp bezels will also be black and give your Dodge Journey a sporty and fresh look from the front. Black roof side rails and a black color lower front fascia round out the appearance of the Dodge Journey blacktop package. The final touch to this feature package is the gloss black grille which is sure to be an eye-catcher. 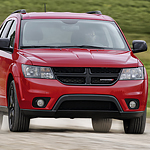 Find out more about the Dodge Journey and the available blacktop feature package by coming to The Razzari Auto Center. You will find that we are happy to let you perform a test drive of the new 2018 Journey.